Note: Rental prices are listed below by 4 hour rate and full day rate. 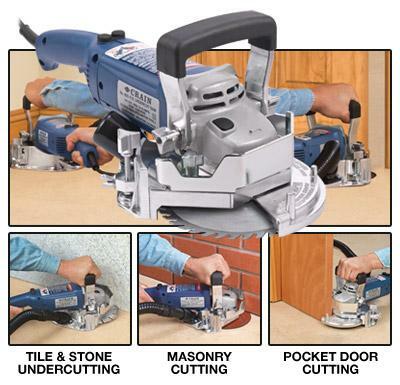 This saw undercuts doors in place, inside corner areas, and can undercut masonry walls and hearths. A diamond blade (No. 822) is available as an accessory for undercutting tile and stone. Features slip-proof height adjustment from flush to the floor to as high as one inch using dual lead screws for setting and holding the height. The aluminum ratchet front handle is very durable and folds down for undercutting toe spaces. The powerful 8.15 AMP motor is geared to produce more torque at a lower RPM, and also throws lest dust. Dust port can be attached to a vacuum (not included) for dust collection. Doors as thick as 1 5/8” can be undercut without removal. Comes with carbide blade, masonry composition blade, carrying case, blade wrench, and instructions. Replacement blades: No. 821 Carbide (wood only), No. 805 Masonry, No. 821 Diamond (not included). Net weight: 17 lbs. © Copyright 2018. Valley Equipment Rental. All Rights Reserved.